Rusty (red and white) and Alice (grey and white) are 5 year old brother and sister huskies that came to NMDOG after they broke free from their chains in a rural part of the state and got into some trouble chasing chickens. “Life” at the end of a chain is no life at all and once these absolute loveMuffins were provided a safe, stable and loving environment (without chickens!) at NMDOG and have been no trouble at all! Rusty and Alice are two of the most well-behaved Huskies you will ever meet. After their ruff start in life, they came to depend on each other in many ways, and they are truly a bonded pair. Alice runs the show, even though she’s little, and Rusty minds his sister. Together they are an absolute joy! They are great with other dogs, every human they meet and kids! We also think, with breed and cat savvy humans, these awesome Huskies would do fine with a cat sibling. We know it might seem like a lot to bring two new pups into the home at the same time and NMDOG is here to support the transition in every way possible. 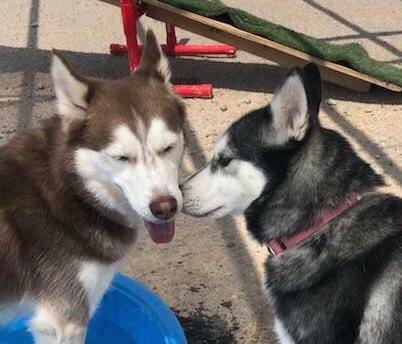 To start, we are waiving the adoption fee for Rusty and Alice for the month of April in celebration of HuskyPalooza 2019!! Check out the event page on Facebook to learn more! 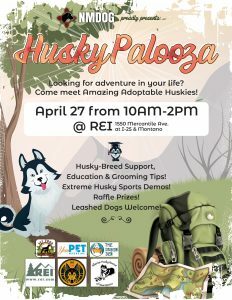 Rusty and Alice will be at the event hoping to meet their perfect husky family! Huskies love huskies and like we always say at NMDOG: “Two huskies are better than one!”. We also offer a FREE 7 week obedience class with all of our adoptions, and we know Rusty and Alice would excel! They are both super smart and love to interact with their humans! Rusty and Alice are also in need of a foster home. At NMDOG, when you adopt one (or two!) of our kiddos, you become part of the NMDOG family. Our dogs come with all they need to begin their new life in a loving home. We start with an in-home meet and greet, followed by a one-week trial adoption period so everyone has time to get to know one another, before making the adoption official. We are here to support our dogs and their humans, every step of the way. We want to set you all up for success!! 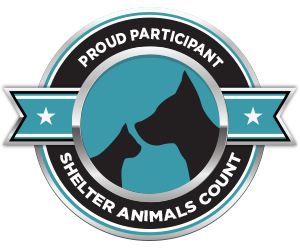 NMDOG is an all-volunteer, foster based, non-profit rescue org, serving chained dogs across the state of NM. In order to help the next chained dog in need, we must find homes for the ones we have already rescued. NMDOG is always in need of foster and forever homes. If you are interested, please submit a foster application or adoption application today! Rusty and Alice will be making their meet and greet appearance at the Quality Mazda showroom located on Lomas NE this Friday 4/12/19 at 2pm. Thank you to our partners at #QualityMazda, for their continued support of NMDOG and our Mission: To serve and protect NMs Forgotten Dogs!! Please stop by their page and show them some NMDOG love!